Until recently, my friend Teju Cole's public persona was that of an enigma in the guise of a sphinx. A veritable chameleon who changes identity with each project, the multiple lives and worlds he inhabits make him a true world citizen, cosmopolitan at heart. And yet he'll insist on normalcy, on being quite specific and local. Luddite that I am, I waited until the paperback was issued to get my copy of Open City. Diaper-changing intervened to delay my immersion into this, his second project, and, further, to prevent me from scratching some words in response. Throughout, I was eager to see what the fragments I had read on Modal Minority had turned into, eager to see how ruthless editing would mold his words in the journey to print publication, eager to see if the omission of the contemporaneous photography would matter, eager to see if the blog/diary episodic feel would leave its imprint on the page. There isn't quite a Metacritic or Rotten Tomatoes for literature, but I haven't encountered such high critical approval for a novel in a long while, and deservedly so. In short, the reception to Open City brings to mind that album, Everybody digs Bill Evans - if not its title. So, what are we to make of Julius's world? Mere flanery? A roman-a-clef perhaps? Or should one simply revel in the keen sense of observation at work and, especially, the hypnotic vocal performance? Well he leaves clues all over the place, up front even. Like a Beckett (or, my favourite, Ionesco), he delights in words and worlds that are hidden in plain sight - and, to digress on a digression, part of what is most interesting about the critical response is that critics can't resist projecting their literary heroes onto him (I've heard of Sebald, Coetzee and more being thrown his way - although the Will Self comparison seemed a stretch, psychogeography be damned). "I learned the art of listening from him, and the ability to trace out a story from what was omitted"
It's right there on page 9. Don't call it a provocation and, certainly, don't call it an obfuscation if he hits you on the head with just what was omitted come novel's end. Focusing solely on the considerable art of listening on display in the novel while ignoring what was omitted misses much of the point. And, well, you, Dear Reader, were warned about the complications. Julius is a great listener, a great observer of people and things and his wanderings form the bulk of the novel. Some might say that Open City is all about listening, call it a guided tour with a peripatetic cipher at its lead. The novel packs erudition in his keen musings, we get to follow him on literal (and intellectual) walks. We learn about a city, its physical embodiment and its history. And yet, the motifs of omission, erasures and absences remain at the core of the novel and are repeated throughout; the gaps in the novel's archeology are equally interesting as what we unearth. It's my belief that the greatest of the "post 9/11 works" was 25th Hour, Spike Lee’s paean to the same open city and its walking wounded. If one is to cast Open City in an analogous light, as a post 9/11 novel, what are its phantom limbs? If you'll excuse a political foray, life in George W. Bush's world was all about these absences: extraordinary rendition, black sites and so forth, the holes where proud twin towers once stood, a return to harshness in immigration policy, wars of choice and their associated, disappearing yet ever expanding body counts, in short a world of blind spots and selective amnesia in public discourse. The gloves came off and we, the royal we, that elusive we, were all collateral damage. But, hey, we were protected by the silences. Perhaps it is as it should be, but it is curious that Bush has been an absence, a similar erasure from our hive mind of the past few years of Great Recession (or Lesser Depression). So then what else is omitted - well, the rush of a narrative plot for one, he's no Elmore Leonard. But this is deliberate and suits the mood. He hasn't delivered the multi-generational family narrative but Open City has similar sweep. Don’t expect overt propagandizing, rather revel in the flow, take the details in, take in the showy learning. It's a soothing balm for these days. Normalcy is Teju Cole's ultimate project. It is a theme he returns to time and again. In Everyday is for the Thief, it was explicit and remains so in his recent output. He writes as an African writer, as a black male, as a Yoruba writer and as a mid-Atlantic modern traveler. But look: dig the conservative pose, Julius loves the arcana of classical music - he’s part of the academy or aspires to be. From the protagonist of Open City to his author there’s an emphasis on how completely normal they are. Perception is everything and the strategy gleaned is about changing the perspective, about focusing on small things and complicating one's ideas about the norms of society. It’s a tough project and one I am deeply empathetic with. "To be seen as normal is to be seen as equal... [it's]... the hardest thing for black people"
And so we should place my friend among those weary sons of Conrad - although stylistically he is more in the vein of Nabokov. His modern urban terrain in Open City is a kind of heart of whiteness - the title of one of the fun fragments that didn’t survive the journey to print. Consider the curious natives his main protagonist tirelessly observes as mere backdrop. Consider their city’s hidden histories as mere fodder for a searching psyche. 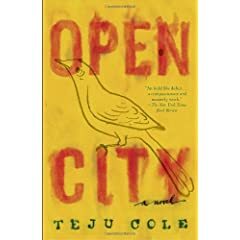 If Open City can be read as a work of excavation, what are we to make of the tendency to dwell on the incongruities of atrocities past, when internal displacement is part of parcel of Julius's present? Well he's written an elegy for a city and its exiled souls, surely that suffices. I admire the artful omissions and the elliptical silences amidst the hypnotic flow. The choice to not provide pat answers serves to resist characterization, further, it's good to be angular and playful and to keep some powder dry in reserve. I settled in and read the book like a thriller, like a Ludlum joint. You've done well, my friend, I dig your sense of normalcy. A head nod in your direction. One of the wryest bits of humour in Open City concerns a neon sign in which two letters don't light up. I'm reminded of the climax of one of Janet Jackson's Rhythm Nation concerts in London (in 1990 perhaps). The song was The Knowledge and at the end there was a montage where some slogans would light up on the stage in call and response: "Ignorance No! Bigotry No! Illiteracy No!". The only problem was that the bulbs for "llit" didn't light up. That snafu is my favourite memory of that plastic performance. Oops. An observation: when African writers branch out in public intellectual mode, the perils of faint praise often follow in their wake. Brace yourself. If only for the immortal line that ends "Posdnuos is complicated". Fascinating. However, I'm not used to reading things on the Internet written by literate people. What do you mean by "flanery"? Maybe I read too quickly, and think I get the gist of your meaning, but I'm not sure. Congrats on your patience in not surrendering to the tyranny of the urgent. Keep writing for us! Most of the reviews go on at length about the flâneur for our times aspect of the book and minimize other readings and, it seems to me, belie some of the richness that I've found. Koranteng, when your book is published, or if you have already published, please let me know. Your writing is fantastic.